From toddler to elder, kajal has been a staple makeup for all. Even I don’t go out without applying kajal on my eyes. “The eyes are the window to the soul” – I believe the same and look for a kajal that not only highlight my eyes but also make them look beautiful too. For many days I was on look of an apt kajal for my eyes. 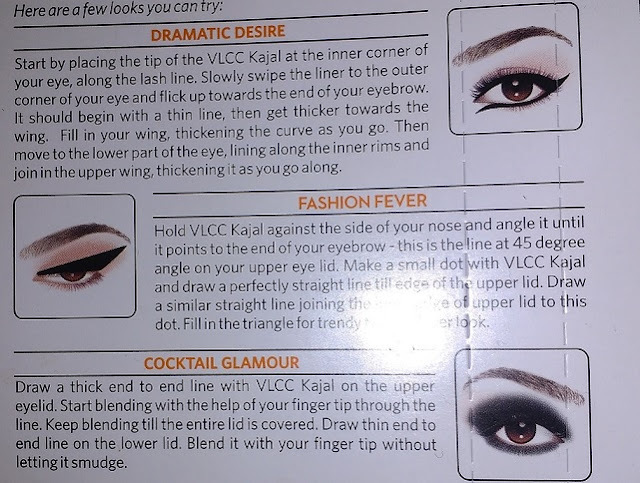 My beautician suggested me to try VLCC Enchanting Eyes Kajal. So, I picked one, and trust me from that day I've worn it every day since I have purchased it, and will perhaps keep it in my bag for tightlining for the coming years! It is a pencil which smoothly glides on the lash line making it suuuuper easy to apply. The pencil style rightly goes on in a thin line so you you’ll need to apply more to get a nice thick line. Normally, I go with a double line application for a glam look. It glides smoothly and enables easy application so that you can play around with it and create dramatic eyes. You can use it both as a kajal and an eye liner as well. As you can see the colour of the kajal is intense black which intensify the natural eye color giving a superb highlighted look. Since I am personally using it so I believe it may last long for 7-8 hours. During application it works out a total smudge free pack but after few hours may be 5 or 6 you will feel little smudge around your eyes. But with a bare makeup that work well. As I carry a minimal makeup in everyday routine so it works great with my eyes. It’s a pencil. It's not dry, but it's not runny and wet, and that is the best thing I like about this kajal. VLCC has given a right texture to their kajal which is legitimately a must-have because it's water-resistant, so user-friendly also. Since, it is not so runny so it stays for couple of days more than my previous kajal – cost effective though. A very important and crucial factor, as I don’t want to sleep with makeup. VlCC Enchanting Eyes Kajal is supery easy to remove and does not leave any residual after cleaning the lash line. At the safety front company claims to use the botanical extracts in VLCC Enchanting eyes kajal. However, it works great with my eyes. If you have super sensitive eyes then you have to give a shot to this kajal. Try with black mascara and your smoky eye will last longer. My Verdict: MUST-HAVE. You do need this kajal! Try it! Love it! Play with it!